South Asia holds on to its top spot as the world’s fastest growing region, with growth set to step up to 7.0 percent in 2019, then 7.1 percent in 2020 and 2021, but the region needs to increase its exports to sustain its high growth and reach its full economic potential, says the World Bank in its twice-a-year regional economic update. The latest edition of the South Asia Economic Focus, Exports Wanted, finds that the region’s growth, while still robust, is mainly driven by domestic demand, which in turn swelled imports and far outstripped exports, further widening trade gaps and current account deficits, and triggering currency depreciation in some countries. l In Afghanistan, GDP is estimated to recover and converge to 3 percent over the forecast horizon, with the assumption that drought conditions will ease and political stability will be restored upon presidential elections in September. An improved security situation would support confidence and economic activity. 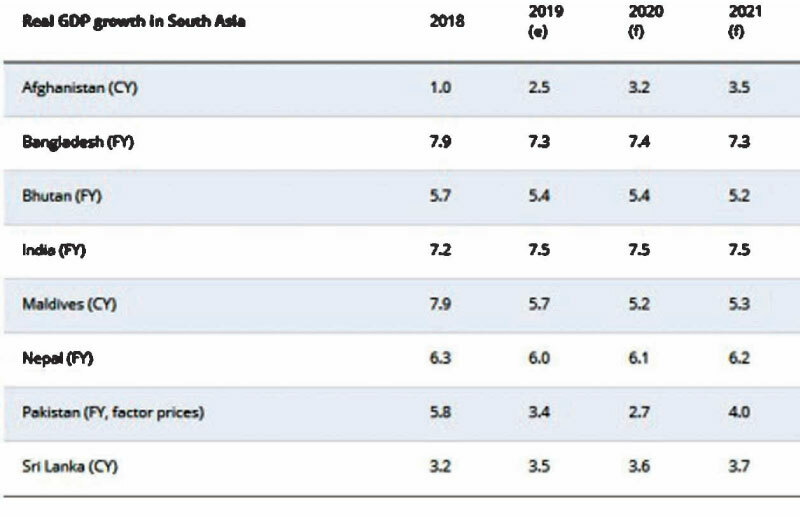 l Bangladesh: GDP is forecast to average 7.3 percent in 2019. Activity will be underpinned by strong infrastructure spending and robust investment with expanding credit growth. However, a slowdown in economic activity of trading partners could restrain the contribution of net exports to growth next year. l Bhutan: GDP growth is expected to remain solid at 5.4 percent in FY2019-20 and to remain above 5 percent over the forecast horizon, supported by tourism and retail trade. l India: GDP is forecast to expand 7.5 percent in FY2019/20. Credit growth will benefit from relatively more accommodative monetary policy amid benign inflationary conditions. Support from delayed fiscal consolidation will partially offset the effects of political uncertainty on economic activity around elections in May. l In Maldives, economic activity is forecast to expand by 5.7 percent in 2019, and to moderate to 5.3 percent over the medium term, as investment projects converge to historical averages. l In Nepal, GDP growth is projected to average 6 percent over the medium term. The services sector is forecast to benefit from strong tourism and manufacturing will be supported by the opening of Nepal’s largest cement factory next year. l In Pakistan, GDP growth is expected to slow further to 2.7 percent in FY2019/20, as domestic demand remains depressed. Macroeconomic imbalances, reflected in large fiscal and current account deficits, are expected to resolve gradually. Remittances flows are likely to support growth and the current account balance next year. A relatively more stable external environment is seen as helping a pickup in economic activity starting from FY2020/21. l In Sri Lanka, GDP growth is expected to pick up to 3.5 percent in 2019 and to converge towards 4 percent over the forecast horizon. The recovery will be supported by a pickup in the services sector and solid infrastructure investment.